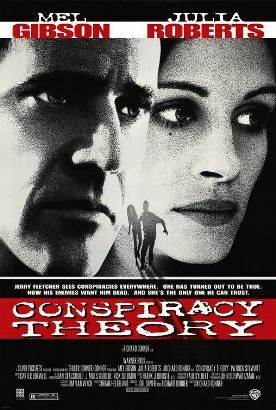 Conspiracy Theory, written by Brian Helgeland and directed by Richard Donner, attempts to do for lunatics what movies like The Shawshank Redemption tried to do for convicts—that is to sanitize them and make them lovable victims of government and society instead of dangerous social malcontents. Charming, blue-eyed Mel Gibson plays Jerry, a middle aged New York cab driver who endlessly spouts his lunatic theories of how the world works to his uncomprehending fares, then goes home to his suspiciously well-stocked apartment to write them up and send them out to the five people on the list of subscribers to his “Conspiracy Theory” newsletter. The high concept which has given birth to this movie is that, more or less by chance, one of his theories proves to be correct, and Jerry is abducted by a sinister governmental, or quasi-governmental agency led by the creepy Dr. Jonas (Patrick Stewart). So far the plot is at least comprehensible, though not very plausible. Anyone who has ever ridden in a New York cab knows that you are lucky these days if your driver can speak English, let alone display an encyclopedic knowledge of every crackpot history of America of the last 50 years. Yet we are ready to accept as the film’s donné the purported fact that one of Jerry’s five subscribers is in fact Dr Jonas (under the name of Henry Finch), and that his interest in getting more information out of Jerry about what he knows must have something to do with a top secret government surveillance operation. Naturally, Dr Jonas, like all the bad guys in these kinds of films, has apparently unlimited use of government issue helicopters and cars and manpower, and his authority to override local police and lesser magistracies, including even the FBI, also lends credence to this view of the matter. But then we are asked to believe that Jonas is some kind of renegade, that his plot actually has something to do with assassinating the president and, most absurdly, that he was already responsible for making Jerry into the blithering idiot he now is by “programming” him as an assassin as part of a secret government mind-control project called MK ultra. As if this were not a lunatic plot beyond the ability of any real conspiracist to dream it up, we also have as Mel’s love interest Julia Roberts in the role of Alice Sutton, a federal prosecutor in Manhattan who is obsessed with the unsolved case (which, nevertheless, has an ostensible culprit) of the murder of her father, who had been a judge. Well, guess what! Dr. Jonas turns out to have been behind that murder as well (motive completely unexplained), but—the fiend!— is able briefly to persuade the beauteous Alice that it was really Jerry, his “programmed” assassin, who did it. Nor is this all. It seems that the ostensible FBI agents who are also involved in watching Alice and trying to catch Jerry are really watching Dr Jonas and aren’t real FBI agents but belong to another, unnamed government agency. “If the intelligence community is a family,” Agent Lowry (Cylk Cozart) explains to Jerry, “think of us as the uncle nobody ever talks about.” What Agent Lowry is doing there is completely incomprehensible apart from the film’s obvious need of him as the sleeper good guy, the sort of but not really bad bad guy, loosely affiliated with the real bad guy, who soon sees that the good guys are good and the bad guys bad and so can be relied upon to bring the cops and the ambulances along to the scene of the denouement just in time, maybe, to save the lives of one or more of the good guys. The question is why we should want them to be saved? Jerry’s character is (as we might expect of a sympathetic madman) incoherent, and Julia Roberts has the same problem with Alice that she always has when she is attempting to act intelligent. In short, neither of them is convincing as a human being, which always makes it difficult for the audience to care very much about what happens to them. And as for the evil Dr. Jonas, not even the estimable Patrick Stewart can bring him to life. The only conspiracy that would sound even remotely convincing, were some brave producer to portray it on film, is a vast, all-encompassing conspiracy of Hollywood writers and directors to bore us to death.